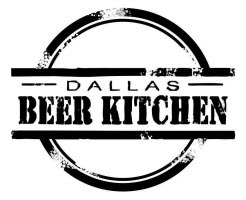 Were it the secret location of an underground dice game, the newly opened Dallas Beer Kitchen (DBK) would have all the makings of a prohibition-era bootlegger's den. Well, except for the fact that the sale of alcoholic beverages is no longer, you know, prohibited. As one reviewer put it, DBK exudes a kind of "speakeasy swiftness", and after taking in the monochrome color scheme and stenciled lettering of the exterior, it's hard not to imagine finding an ad for this place in a 1930s newspaper. It's an appropriate theme given the pub's location, seeing as how that's right around the time the Greenville Avenue district got its start. As for what's on the inside, were you to characterize what you see along the street as unique and minimalist, such descriptors would likely follow you on through the door. The decor is simple and practical with a fitting array of grayscale images depicting the city in early times, the centerpiece of which is a rendering of the original Dallas Brewery (first built in 1885). There's also a flat screen TV for those needing a touch of something modern, but even that's about as unobtrusive as you can get. The minimalist tag, however, does not apply so much to what you'll find on the menu. That's a good thing, especially considering that the uniqueness aspect still applies. Where else are you going to find pop tarts, or fried biscuits and ice cream served alongside a set of movie-themed burgers and bites? For me, The Goodfella was just about "As Good as it Gets", and I could certainly see myself kicking back with it and a brew while watching The Big Lebowski (read the menu, you'll understand). World-class beer is also the order of the day, with 4 out of every 5 brews among 30 taps scoring a 95 (out of 100) or better according to reviewers on Ratebeer. There's a good mix of local and national brands as well, and while some might see the offerings as a little IPA heavy, there may be no better place to do a blind tasting of craft beer's most popular style. As to the prices, the average cost of a pour during my visit was right at $6. Taps rotate perpetually, and they fill growlers too. Going on first impressions, DBK comes across as a casual, craft-beer focused endeavor that seeks to be something different than your run-of-the-mill gastropub. At least so far, they seem to be going in the right direction. Of course, I imagine the owners are hoping you'll come in and find it to be one of the "Best Damn Things." One piece of advice, though. If you're the type that likes to bury your nose in the aromas of your glass, sit as far away from the popcorn machine as possible. Hey, no place is perfect.